One of the things that got us excited about linguistics back in the days wasn’t any kind of scientific holy grail, such as why only humans have language or whether we are born with an innate language faculty. It was something very simple, namely: why are there so many different types of “R”? As a speaker of an Eastern-Dutch dialect, I (Jeroen) noticed I could never roll my R’s with the tip of my tongue like in Spanish or Italian. 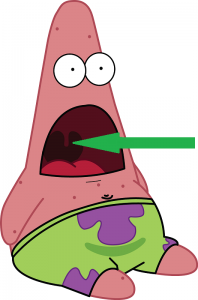 Rather, I roll my R’s with my uvula (the little “ball” in the back of your throat, see the picture below). Why, I wondered, do I roll my R’s in my throat, whereas most people in Amsterdam roll their R’s with the tip of their tongue? Why was my throat-R the main R in the German language, whereas most speakers of Italian, Spanish, Swedish and Norwegian all roll their R’s with their tongue-tip? What could be the relation between a consonant produced in the front of your mouth and one produced in the back of your throat? It also struck us that when a language or dialect made use of a certain “type” of R, there was still a lot of variation in how and when it was produced. Take English, for instance. In most dialects of British-English the R is made with the tip of the tongue, but, contrary to e.g. Scottish-English, there is no trill – rather, the tongue-tip moves towards the sockets of your upper teeth, or alveolar ridge, but only approaches it – we call those types of consonants approximants. Further, whereas in Scottish-English you always pronounce the R, in British-English you only pronounce it when it appears in the onset of a syllable (e.g. break), but not in its coda (e.g. car is pronounced “kah”). In most dialects of American-English you would also use an approximant-type R, as in British-English, but you pronounce it in both the onset and the coda of the syllable. And there is much more R-variation from other languages. In most dialects of Swedish and Norwegian, people use a rolling tongue-tip R, except when it is followed by another consonant made with the tongue-tip, such as S, L, T and D, in which case it “melts” together with it. 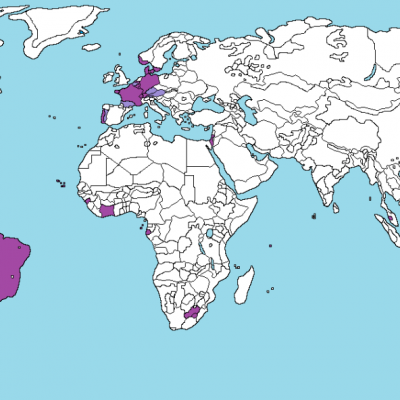 In some of their other dialects, e.g. the Bergen dialect of Norwegian and various Southern Swedish dialects, people use a throat-R. This throat-R is also found in Danish, but contrary to the Bergen and Southern Swedish varieties, it is not rolled but more like a closure in the throat (a uvular or pharyngeal approximant), and somewhat similarly to British-English, it disappears into the vowel in syllable coda. And the variation just goes on and on. So, you might think, do these sounds actually have anything in common? The main thing they appear to have in common is that they are all written with the same letter, but, at least at first glance, it might seem like there is not much in terms of pronunciation that groups the French throat-R together with the English tongue-tip R.
This is where the rhotics come in. The tongue-tip R, the throat-R, approximant or rolled, and every other imaginable type, they all belong to the class of rhotics, which are “R-type” sounds in linguistic terms. Most languages (some 75%) have at least one rhotic sound, and some languages like Toda and Malayalam, as well as many Australian languages, even have three or more. The most prototypical rhotic is a rolled one made with the tongue-tip, but it can be any other R-type sound. So what characterises all these sounds? Rhotics tend to appear close to the vowel, which is the core of the syllable. So it is much more likely for a language to have a word like ‘pratarf’ than a word like ‘rpatafr’. This is because rhotics are much more like vowels than the average consonant. And the average consonant usually appears on the fringes of a syllable, whereas sounds that are more vowel-like like to appear close to vowels. Rhotics tend to merge with vowels. What we see in languages like British-English, German and Danish, for instance, is that R’s that occur after a vowel are often lost. In American-English, the vowel i in “bird” (pronounced “uh”) is not a sequence of a vowel and R, it is just an uh-coloured R – brrrd. Rhotics often “colour” vowels, which means that a vowel that is uttered next to a rhotic will be pronounced differently. We see this in most of the Scandinavian languages. In Danish, for example, an a is produced differently in a word like mad ‘food’ than it would be in a word like radio. The prototypical rhotic is a trill, be it made with the tongue-tip or the uvula. So even though throat-R’s and tongue-tip R’s have little in common from an anatomic viewpoint, we have enough reason to think of them as falling under the same group. What the points above imply is that rhotics are very prone to change: as they generally appear next to vowels, they tend to blend in with them to some degree. They might at some point be pronounced in a ‘softer’ manner, such as when the rolling tongue-tip R changes to an approximant, and they might blend in with vowels completely in certain environments – such in the British-English, Danish or German type of R towards the end of a syllable, where it basically becomes a long vowel. And to what extent this kind of thing happens varies strongly from language to language, which is one of the reasons we have so many different types of R.
So now we know a bit more about how an R can change. But one thing we haven’t answered yet is how we get from a tongue-tip R to a throat-R. To speakers of a language or dialect with a tongue-tip R, the throat-R seems extremely impractical (and the reverse for us!). Why do we find throat-R’s in so many parts of (mainly Western) Europe? The somewhat disappointing but honest answer to this is that we don’t know for sure. According to urban legend however, for Western Europe it started in Paris: at the time of King Louis XIV, the French R was in fact a rolled tongue-tip R. Louis XIV, however, was supposedly unable to produce this consonant, quite possibly due to a speech impediment. So what did he do? He just rolled something else, namely his uvula. As he was the king, this kind of pronunciation supposedly became popular and spread across Western-Europe. And this makes sense from a perceptual point-of-view: if we are used to distinctive sound being rolled or ‘trilled’ and this is usually made with the tongue-tip, the closest you can get is by rolling your uvula – it kind of sounds the same. That Louis XIV might have used this R as a substitute for the more common one in fact became apparent to Jeroen in Timor, Eastern Indonesia: I (Jeroen) was a speaker at a language conference in Kupang, where I noticed that one of the Indonesian speakers rolled his R’s in his throat. Imagine my surprise! I had been practicing the prominent Indonesian tongue-tip R for months to make myself intelligible there, and all of a sudden I heard an Indonesian speaker with a type of R that sounded like the one in French. After the conference I asked him what dialect he spoke, which turned out to be Kupang Malay. This dialect has no throat-R’s – in fact no dialect of Indonesian has. When I pointed out his R to him (this was not rude, as he was also a linguist), he said “Oh, my tongue is just a tad too big for my mouth, so I just make another R”. And it makes sense to roll either your tongue-tip or your uvula. The thing that trills, i.e. the ‘triller’, has to be small in order to vibrate efficiently. So it is usually either the tip of the tongue, or the uvula. (There are also languages that have a trill made with both lips –bvrrrr-, but this is very rare.) When you can’t roll your tongue-tip, you can always roll your uvula. So what do you do when your language doesn’t have a rolled R, but an English-type of approximant R? In that case it would not make sense to roll your uvula, as that would sound nothing like it. In that case you make another sound that sounds most like it – another approximant. 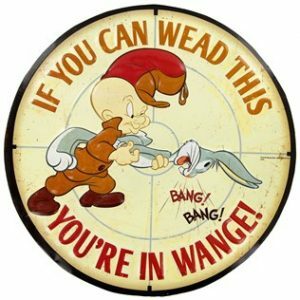 We are all familiar with Elmer Fudd’s typical pronunciation of R (Ah, wabbit twacks! ), which is actually the result of not being able to pronounce the English approximant-R. A famous real-life example is Jonathon Ross. He is notoriously unable to pronounce the English R due a speech impediment, and so just produces the sound closest to it, a W-sound. Whether Louis XIV’s story is the truth behind the throat-R or just an urban legend, we don’t know for sure. But as it is quite clear that many speakers cannot produce an R correctly and substitute it with something alike, and that he was an influential and fashionable king, it is at least plausible. A topic worth looking further into! Andrea Brink Siem and Jeroen Willemsen both work and study at Aarhus University. They wrote the article together based on a shared interest in speech sounds. Interesting blog! BTW, not all celebrities get away as well as Louis XIV with their “deficient” “r”. Gianni Agnelli, member of the FIAT-dynasty and important person in Italy during his lifetime (he died in 2003), was systematically mocked for his “r moscia” (“soft r”, an Elmer Fudd-like sound) in political cartoons, where his “r” was represented by a kind af handwritten “v”. Mr. Agnelli was from Piedmont, a region bordering to France, and there are still discussions going on in Italy as to whether the “r moscia” is an articulatory impediment, a sign of snobism or – at least in Piedmont – a dialectal trait due to language contact with French.